The ideal ankle fusion is one which has as near to 100% chance of union at first attempt as is possible (90-95% in the case of arthroscopic ankle fusion) and allows the patient to weight bear lightly and walk immediately. It also should have low levels of post operative pain. This description serves to illustrate the main advantages of arthroscopic ankle fusion leading to a quicker recovery time only low levels of pain in many cases (see the testamonials section for patients own descriptions). The operation is performed by using the standard two small incisions for ankle arthroscopy as well as two further small incisions to place the two screws required for fixation (usually to the medial side of the ankle). Preparing the joint surfaces arthroscopically leaves the ankle with its normal convex and concave surfaces and inherently stable. The minimal soft tissue disruption also contributes to this stablity (with screw fixation) and provides the optimum conditions for bony union. 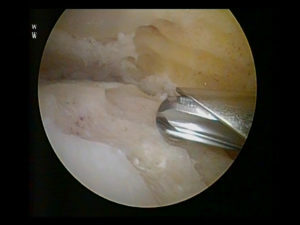 Using the arthroscopic ankle fusion technique also means most patients avoid the need for cumbersome and restricting plaster casts. Instead a removable boot such as the Aircast or Ossur rebound walker can be used from day 1 post-operatively in most cases. The low level of pain and high mobility means that the majority of patients require only one post-operative day in hospital. How does an arthroscopic ankle fusion compare with an open fusion ? The most important difference is the chance of a successful ankle fusion. 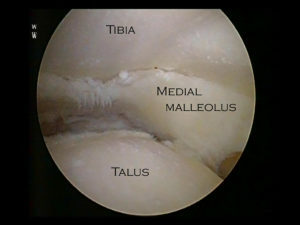 With the arthroscopic technique there is between 90-97% success. At best with the open option one can expect a 80-90% primary fusion rate (this means the chance of a successful fusion occurring after the first operation). Post operatively it is routine to avoid walking for 6 weeks following a normal open ankle fusion. Post operatively it is normal to be in a non-removable plaster cast for 6-12 weeks with an open fusion . A post operative hospital stay of 2-3 days is not unusual after an open fusion. The limiting factor is usually post operative pain. The more extensive surgical wounds required are also not infrequently slower to heal. For whom is an athroscopic ankle fusion most suitable? Younger and higher demand patents ,with a non salvageable joint , with severe and isolated ankle arthritis . People of working age engaged in Heavy manual occupations. Patients with any degree of passively correctable ankle deformity & also in some with fixed deformity. In more severe fixed deformity cases a patient may require a standard ‘open’ fusion. What is the post-operative course after an Arthroscopic ankle fusion? Your leg is likely be entirely numb and pain free immediately after the operation and for 8 to 36 hours due to a regional nerve block that will be injected to the leg whilst you are asleep. Following this tablets for 2 or 3 days are usually required. An ache relating to activity is usual thereafter and should be “listened to”. Do nothing that gives pain . You will have a temporary plaster applied at the end of the operation. This will be changed the following day to a post-operative boot. It needs to be worn for all weight bearing activity for the next 12 weeks at least.You will spend a day or two in hospital usually. You will mobilised by a physiotherapist the day following the operation. You may put light weight through the ankle whilst using crutches. You don’t need to and your leg will tell you what is comfortable to do. Listen to it. The maximum is 50% of body weight over these initial weeks. After 6 weeks if X-rays are satisfactory the amount of weight can be increased. The soonest you’ll be off crutches is probably 10 weeks , but it might be 12. It is far more important that your are comfortable from the ankle than you come off crutches early. 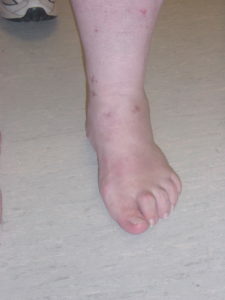 Exceptionally it is necessary to delay weight bearing post operatively until the six week stage .This may be due to another procedure being required, such as adding extra bone graft to the fusion site ( because of the loss of large areas of bone) or an Achilles lengthening to correct deformity. You will require DVT prophylaxis with Clexane or Fragmin for 4 weeks or so. At 6 weeks there is an outpatient review and check x-ray. Generally at this stage you will be advised to gradually increase your weight through the operated leg and if comfortable aim to come off the crutches by 9-12 weeks but continue with the post-op boot. An outpatient review and check x-ray is required at 12 weeks. Now it should be possible to come out of the post-op boot. and get into a stiff soled hiking boot that will come well above the ankle. This you will require for another 6 weeks. In general most people are able to drive a manual car by 12 weeks post-op using a supportive hiking boot. What is function like after an ankle fusion ? Following ankle fusion surgery a patients gait (or the way they walk) will in most cases be normal or as a minimum much improved. This is possible because there are other joints close to the ankle which, if mobile and non-arthritic , allow the foot and ankle as a whole to move well even without ankle motion. Generally a patient will be able to wear normal shoes following an ankle fusion. If however the foot is very stiff some modification of footwear may sometimes be necessary. This may mean wearing a lightweight walking type boot for longer periods of walking or looking for shoes with a stiffer sole. It may be that the sole of a normal shoe needs to be stiffened and a rocker type sole formed. Whether leg length is effected after ankle fusion depends very much on the extent (and depth) of the arthritic process effecting both sides of the ankle joint. It also is effected by the technique which is being used. Following an arthroscopic type ankle fusion you would usually not expect any measurable change in the limb length and no functional difference in limb length that you would notice either. Occasionally, after open fusion a slight raise may be required on shoe-wear but this is unusual. A patient is likely to be able to return to most activities following isolated ankle fusion, assuming the neighbouring joints are arthritis free. This would certainly include returning to heavy manual duties, being able to walk distance and the use of ladders. Furthermore a patient would generally be able to break into a short light jog . 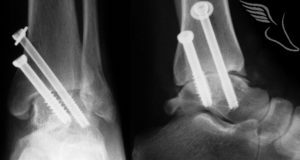 The ability to run following an ankle fusion is not unheard of and is dependent on many factors , not least of which is the maintenance of a very mobile subtalar joint post-ankle fusion. It also has to start off fairly mobile pre-fusion and this is not the case in all patients. Good descriptions of what patients from the clinic have been able to do are to be found in the testamonials section. I attended the Foot and Ankle Clinic several times and felt the Clinic to be efficient and well run. The staff where friendly and reassuring and there was the use of the lifts and a wheelchair if needed. The Clinic is second to none. My surgery has been a great success. I spent approximately threes months post op wearing an Aircast boot, which was comfortable and could be removed for showering etc. I had regular checkups afterwards to make sure bone was forming to fuse the ankle. Going across to the x-ray department was always quick and efficient. The Surgeon always explained things to me clearly throughout the process. Finally I would like to say that my ankle fusion has turned my life around. Beforehand I was in much pain when weight bearing and I am now completely pain free. I am able to walk for miles again, including over rugged ground. I regularly cycle and ride my horse without limitations. I walk perfectly normally and no-one would be aware that I have had an ankle fusion. It is with pleasure I write this testimonial to the Foot and Ankle Clinic. The experience has helped me turn my life around. I am now able to enjoy my life on the golf course playing twice weekly. The Foot and Ankle Clinic was first class with very helpful and friendly staff in all departments. The surgery was again excellent – over and done before I realised it and now bearly noticeable. I would have no hesitation in recommending anyone (and I have done) to the Foot and Ankle Clinic. Thank you most sincerely for what you were able to do for me. 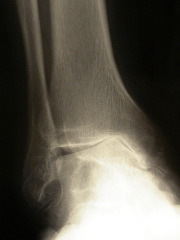 I had my complex ankle fusion operation performed at the Foot and Ankle Clinic in Edgbaston in October 2006. I had spent over a year putting this off as other surgeons had left me with a feeling that an open procedure was a major operation and that whilst the arthritic pain would be gone my future mobility was not guaranteed. Indeed I was told that there was no chance of me being able to run again which was very difficult news for a sportsman such as myself. My first consultation at the Foot and Ankle Clinic easily convinced me that I should entrust my ankle operation to the surgeon (Mark Herron). Not only did he discuss things with me as a person rather than a human with a bad ankle but he explained that he could do the procedure via arthroscopy rather than open surgery thus reducing the recovery time. The staff at the Clinic were excellent and the operation went well and I was soon up and about in an Aircast boot which gave me good mobility. It was hard to stop myself wanting to do things too quickly during the recovery process but you cannot rush it. However I am now back at the gym, run 5K regularly and play golf as often as I can, not bad for 57, even without an ankle fusion. “I would be only too pleased to share my experience regarding my decision to have an ankle fusion. It was certainly not a decision took at the time that I took lightly but actually turned out to be the best decision of my life. Previous to the fusion I had tremendous debilitating pain, the waking hours by far the worst and it was humiliating and embarrassing for me to get about for the first few hours in the morning and afterwards my movements were very strained and awkward and I had a very noticeable limp. Any exercise was a great effort and caused too much discomfort. Since fusion my level of activity and function is near normal and there is not the slightest hint that I ever had a problem and there is certainly no pain whatsoever. Mr J Tilley ,Birmingham ,2013. I first had an appointment at the Foot and Ankle Clnic in May 2010 having suffered for many years with severe ankle pain. I completed tests and x-rays and diagnosed a problem with my subtalar joints. From the outset the treatment options where explained and I had my operation two weeks later at the Priory Hospital in Birmingham. I was impressed throughout with their caring attitude and how well I was kept informed at all stages. Following a short stay at the Priory Hospital I spent 4 weeks in plaster before being fitted with an Aircast boot. Now I am pain free and for the first time in many years I am able to enjoy long walks and take part in exercise. I cannot thank the Clinic enough for the excellent care I received and the beneficial results achieved. I am so pleased with the results that I have arranged to return to have my other ankle treated. I would like to update you on my progress after the two operation that you performed on both my ankles last year 2007. I had advanced osteoarthritis in both ankles and was becoming increasingly less mobile and more overweight. I came to your consultancy rooms at the Priory Hospital Birmingham in April 2007. At that time you examined me and estimated my walking time at 5 minutes. On the 16th May 2007 I had my first operation which was a fusion of my left ankle and sub-talar joints this was a great success and I left hospital after 3 days. On the 24th October 2007 I had my second operation, which was a fusion of my right ankle. This again was a success and I left the hospital after only 2 days. The situation now is that I am completing bicycle rides in excess of 25 miles and have just completed a 6.5 mile walk (new personal record). I go from strength to strength on a daily basis and I am looking forward to completing a 10 mile walk in September for the Heart Foundation. These two operations have transformed my life for which I will be eternally grateful to the Priory Hospital, its staff and especially to the Surgeon for accepting me as a patient and using his unbelievable skill to return me to a mobility situation that I have not enjoyed for almost 20 years. If any future patients should consider the same treatment and are somewhat apprehensive, I suggest they be referred to the excellent and informative Foot and Ankle Clinic. I found this most useful as it gave me the opportunity to understand my problem, the surgery and to ask the right questions. Finally at 64 years old this year I walk without pain, I have no walking aids and I walk in the same types of shoes (off the shelf) as I did before my problems began many years before. Once again I am eternally grateful for your skill and dedication to people who suffer from the terrible pain of osteoarthritis. During 2015 my left ankle began to cause me severe pain and difficulty walking. Both ankles were swelling up even when I took a short walk. 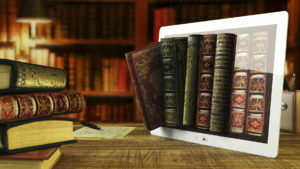 I was seen by Mr Mark Herron shortly before Christmas and he informed me in great detail what was the best option for me. This was to have my ankle “fused” by screws. I was operated on at the end of January 2016 at the Priory Hospital. I was able to move about on crutches initially and then moved into an Aircast boot for a few months. I was regularly seen by Mark Herron, monitoring my progress. He told me to buy a high fitting hiking type boot which I would require to support my ankle and made sure I had to correct one. I now walk without a limp and for some distance without any problems. Since the operation there has been no swelling of either ankle. I am not going to take up tap dancing but I am not now walking around like an old man. If I speak to anyone having ankle problems I strongly recommend them to make an appointment with Mark Herron and get some help. I cannot thank him enough for sorting out my ankle so well. I am a 66 year old male who has valued being physically active all my life. I took up running in my late twenties and have enjoyed fell running and orienteering as well as hill walking. A couple of years ago a twinge in my ankle developed into constant pain such that I had to give up running although cycling was still o.k. During 2008 deterioration continued and I was walking in discomfort and with a bad limp. I suddenly felt like an old man. My G.P. diagnosed arthritis as the problem, suggesting an ankle fusion as a solution and he made an appointment to see a specialist at a local hospital though I had to wait 3 months for this. The arthritis was confirmed and an open surgery fusion was offered. I was hesitant about this being aware of infection issues given that my problem was not life threatening – just life inhibiting. I did come away with a website link to the Priory Hospital however, which immediately inspired confidence. I got a quick consultation and was assured that an arthroscopic fusion would be the best option for regaining an active lifestyle, so I immediately booked an operation date. I had my operation early in February 2009 at the Priory and I have no hesitation in saying that the whole experience was easier than I had anticipated. The surgeon (Mark Herron) and his Team were reassuring in their friendly professionalism. Post – operative care by Priory staff was excellent and after two nights I was discharged. Living with an Aircast boot and crutches for a few months is not ideal but one adjusts and tries to be patient with anticipation of a positive outcome. I came out of my boot and was discharged on 1st May 2009. It took a few weeks to get walking comfortably again due to my foot operating in a different way. A holiday in Scotland encouraged me to try a few walks of up to 5 miles and the foot ache gradually subsided. At the end of June I was confident enough to climb Snowdon. I experienced no ankle pain but a little swelling the day after – which did not last. Over the summer I have completed four orienteering events on rough terrain with no ankle problems whatsoever. I have even started (slowly) to run again. So all in all I am really pleased I bit the bullet and went for the ankle fusion operation. I suspect that the procedure undertaken by the surgeon and his team at the Priory Hospital Birmingham would take some beating. “After the fusion in April 2010, I spent 12 weeks on crutches, as anticipated. … In the early days I had a little bit of start-up pain but that gradually disappeared.In March 2011 I celebrated my 60th birthday with a weeks’ skiing holiday in Austria and coped well with the stresses of twisting and turning down demanding red runs.After almost 12 months after surgery I started running short distances then walking and back to running. 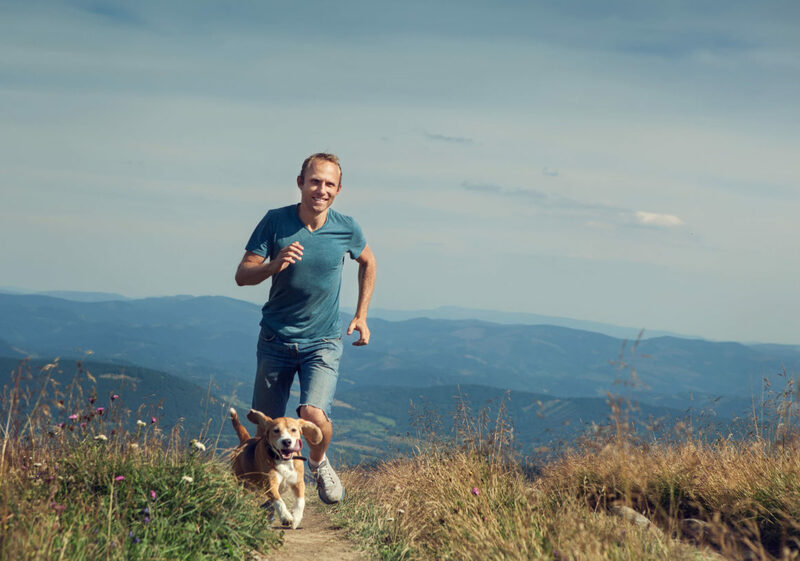 … In April 2011, I was able to do 20 minutes sessions, gradually building up speeds to around 9 minute mile pace (I am much fitter and I can manage more strenuous sessions).My first tennis practice occurred in February 2011 and throughout the summer tennis activity increased playing regular doubles matches, which could last over 3 hours. I am still finding it a little bit difficult to spring off my left ankle say for overhead smashes and serving but I have no problem with the general movement around the court.Currently I am still playing tennis regularly throughout the week and I am doing 1 hour running sessions twice a week at approximately 9 minutes per mile. In summary, I am delighted with my progress, as I am now able to carry out all my former sporting activities which I could never have done at all back in February 2010 when I was diagnosed with an arthritic ankle, preventing me from even walking normally.Since February 2010 when he told me I had “had had the best years” on my ankle and it was “shot”, I have recovered tremendously thanks to your excellent skills and thank you so much for all you have done to enable me to lead an active sporting life again. I am a 69 year old and still fit and active thanks to the skill at the Foot and Ankle Clinic. My right ankle was becoming increasingly disabled through osteoarthritis and my ability to run and even walk was diminishing and my horizons were shrinking and my frustration increasing. I had seen surgeons through the NHS who offered a variety of solutions over a 5 year period, and frankly I always chose the “do nothing” option because I was afraid things would go wrong or infection would be acquired. At Easter 2009 I was orienteering in Northumberland when I came across a fellow orienteer who was on crutches and in an “Aircast boot”. He had recently had an ankle fused at the Foot and Ankle Clinic. I followed the orienteers progress through the year and was eventually satisfied that what had been done for him would probably work for me with a good outcome. Late in 2009 I had my first appointment and felt very confident in the surgeons ability to get me back into a more active life. Given that my other ankle is already showing signs of osteoarthritis that was also checked to ensure that the treatment for the worst ankle would be consistent with my long term needs overall. I was offered fusion rather than ankle replacement on the basis that with the active lifestyle I was living and intended to live more vigorously in future, I would be likely to wear out a replacement whereas the fusion is for life. I had the operation in January 2010 and the recovery period was tedious at the time but it led to a good fusion. I recall that at the 12 week “boot off” stage it was suggested that I might start a little very gentle cycling on a static bike – but I had already been out on my mountain bike three times with the boot on for about 10 minutes each time – but no damage had been caused. I had been walking as much as I could initially on the crutches but later unaided. At the Foot and Ankle Clinic I was always treated with the utmost courtesy and treated as a person with an ankle issue and not a patient. Every question was fully answered and the level of reassurance was significant and personal. The short stay in hospital was much better than I had feared and I was well looked after and was pleased to find a wine list available with the menu options. Now nearly 18 months after the procedure my full range of abilities has been restored and I can walk further than for some years, have been skiing, climbed mountains and improved orienteering. I have even added golf to the activity list – which would not have been a comfortable option previously. With all I have achieved the other ankle is now complaining! I will know where to go to get that fixed when the time comes. My experience of the Foot and Ankle Clinic is that it is professionally and efficiently run. I felt at ease and a real person in pleasant surroundings. Knowledgeable, concerned staff that cared what happened to me was also my experience. The ankle fusion surgery at the Foot and Ankle Clinic was successful and remedied the faults with my ankle. After being unable to walk unaided for 14 months my quality of life has practically returned to normal. Followup treatment was also very good with no stone left unturned. An example of this was a query DVT which was immediately checked and reported back on. Again very good supportive nursing staff in attendance. Physiotherapy and occupational therapy treatment was particularly good both before and after my ankle fusion surgery. The staff completely put my mind at ease and answered all necessary and possibly unnecessary questions I put to them. I had many years of pain and increasing difficulty walking following osteoarthritis as a child. 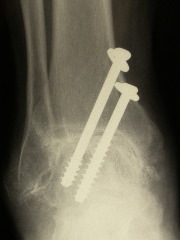 In July 2008 I had two titanium screws inserted to fuse my ankle using arthroscopic (keyhole) surgery. The pre and post operative care was excellent and also my stay in hospital. You have to be a patient patient as anything orthopaedic is a long business but worth it in the end. I can honestly admit I was more than a little concerned with the prospect of undergoing surgery on, by now my very degraded and painful ankle. My options were fully explained and after careful consideration I finally requested the fusion procedure. The surgeon and his team kept me up to date with all details and what to expect; even to the extent of showing me videos of previous patients walking after the operation. After the operation in 2005 I experienced some discomfort for approx 6 weeks, but always thought that my ankle movement would be greatly restricted, resulting in curtailing my two main passions; motorcycling and my local gym. It could not have been further from the truth, as virtually full movement had been achieved and gymnasium and motorcycle activities are back to normal. I do not limp when walking and still manage to run on occasions. I have experienced no adverse effects from the operation and have not missed out on any of my previous activities. Overall, the operation, pre and after care was a complete success and I must fully endorse this procedure. “I found the whole procedure to be relatively pain free and was able to dispense with the taking of prescribe Codeine after just 2 weeks, thereafter just taking Paracetamol. The principal discomfort or inconvenience was wearing the aircast boot for approximately 12 weeks and of course using crutches. This was followed by a period of wearing high walking boots. This inconvenience was a small price to pay for the benefit I have subsequently enjoyed. Before I had the operation I would be in considerable pain and movement was very restricted, now I am able to once again walk regularly and to play golf. There is of course some restriction in the ankle movement but I have not been inconvenienced by this in any way.